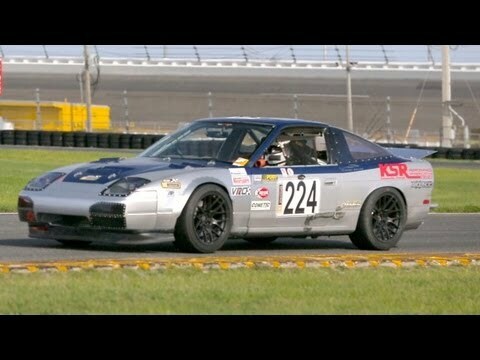 This week on The J-Turn, I head to Florida to race a Nissan 240SX on one of the world’s most epic tracks: Daytona International Speedway. There, I meet with my team from “Little Flatout Racing” and begin preparing for the fourteen-hour Chump race. With the help of Kevin Smith from KSR Performance & Fabrication, their Nissan 240SX was specially modified to suit the team and included custom pedal extensions, special flooring to reduce heat, air ducts to cool the driver, and a custom fuel cell, to name just a few modifications. The team also added roll-bar enhancements for increased protection, as Daytona is among the deadliest tracks on the planet. 34 drivers have died there, including Dale Earnhardt, and the specter of grave danger is ever-present. Find out how I fared on the track against professional competitors and see whether the Nissan 240SX was able to finish the grueling fourteen-hour race.